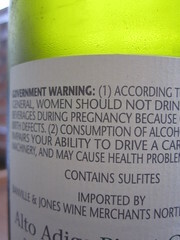 it was documented that for a very small percentage of the population, sulfur dioxide was found to give an adverse allergic reaction to asthmatics and other air-borne allergens sensitive people and some doctors have suggested that asthmatics avoid wine altogether. so, there you have it. if drinking fruit juices and eating dried fruits does not give you a headache, then sulfites in wine will not more give you one. as i always say, the best way to avoid a headache is to stay hydrated and that means drinking plenty of water before, during, and after wine tasting.